This summer, among other projects, I've had the pleasure of learning the ropes of running an art gallery. I've been an intern at Corey Helford Gallery, one of Culver City's premier art galleries. I've gotten to take part in many exciting projects all related to the workings of the gallery. Last night, I worked at the opening night of the latest show at Corey Helford Gallery: "Eric Joyner: First World Problems". Mr. Joyner, who is based in San Francisco, has nonetheless built quite a local following: demand for both his works in the show and the prints the gallery was selling last night was quite high. 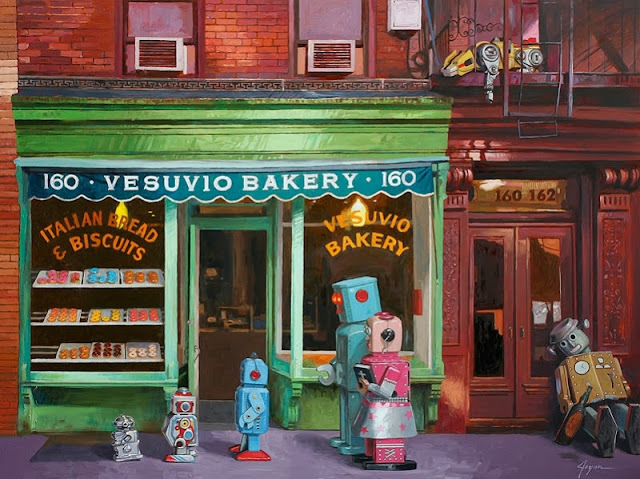 Mr. Joyner's paintings were a pure whimsical delight, juxtaposing colorful, almost anthropomorphic robots with the charm and coziness of 1950s small-town America. Last night's show focused specifically on the relationship between the robots and what he has made their one true weakness: the donut. Robots buying donuts, selling donuts, feeding donuts to swans in a park, fishing for donuts in a stream: Joyner manages to combine such disparate elements as the aforementioned robots and donuts in a range of lovely settings. His works seem both old-fashioned and futuristic, marrying a unique subject matter with a tender, skilled brush. When so much of contemporary art is focused on pain and suffering, it's refreshing to engage an artist who paints from pure joy (pun not intentional) and curiosity. "The Lost and Found." Reproduced with permission of the artist. In person, Mr. Joyner is affable and remembered my name (which, as an intern, I did not expect from the featured artist at a huge gallery opening). He was happy to let me interview him via email, and I was so taken by his works on display at the gallery that I jumped at the chance. I On the Arts: When did you start making art? What's your art background? 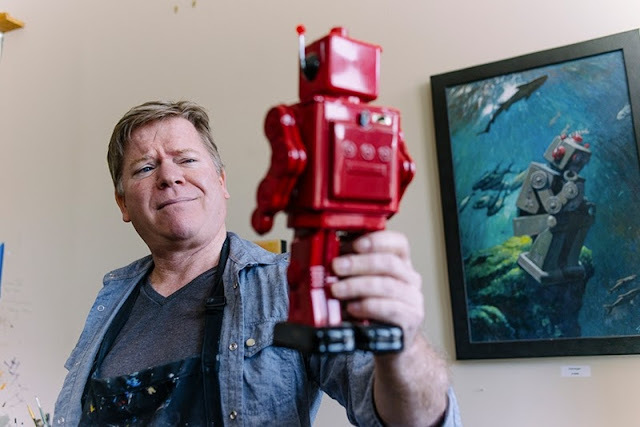 Eric Joyner: I started in kindergarten, drawing dragsters and trees. Hey! I should revisit this subject matter... anyway, I have a classical art training, from the Academy of Art. However, I learned from books, observation and lots of practice. IOtA: What drew you to painting? What other media do you use? EJ: I guess I just liked drawings and color. Later I liked how I could escape into a painting. In addition to oil on wood panel, I sometimes use a 2 part epoxy resin and inks to make as a 'frosting' for steel "robot food". I collaborate with Alex Macleitch, a metal sculptor. The artist. Reproduced with permission of the artist. IOtA: What artists inspire you? What else inspires you? EJ: I like the post impressionists and illustrators from 50 to 100 years ago. There are some recently deceased fantasy painters as well. To name a few: Van Gogh, Degas, Manet, Monet, Bellows, NC Wyeth, Hopper, Cornwell, Rockwell, Lyendecker, Frazetta, Jeff Jones and Wayne Tiebaud. I am also inspired by scientists, movies, writers, music, nature and the universe. IOtA: What has most challenged you as an artist? EJ: Dealing with those who do not wish you well. [It's] also very difficult to do you work and not neglect your friends too much. It takes a long time to figure what to do that is unique and your own voice. IOtA: Why robots? Does all of your work center on robots and their juxtaposition with the mundane? EJ: Although I like them and other things, my work does not center on them. It's what they are doing and the places that I put them that I find interesting. IOtA: What has been the most exciting moment for you as an artist? EJ: There have been many exciting moments, so it's hard to choose just one. Having said that, I'd have to pick the moment when my painting "The Final Blow" was chosen for the international art book Spectrum 11. I fell out out of my chair when that happened. IOtA: What do you hope people take away from your work? EJ: I hope people take away a positive feeling and that there are many reasons to be happy. "Eric Joyner: First World Problems" runs until September 7. For my readers who want a taste of pure fun and whimsy with their art, it should not be missed. This in a really nice interview! You posed some good questions and he certainly seemed interested in supplying answers. I like your interviews because they give great insight into the artists!